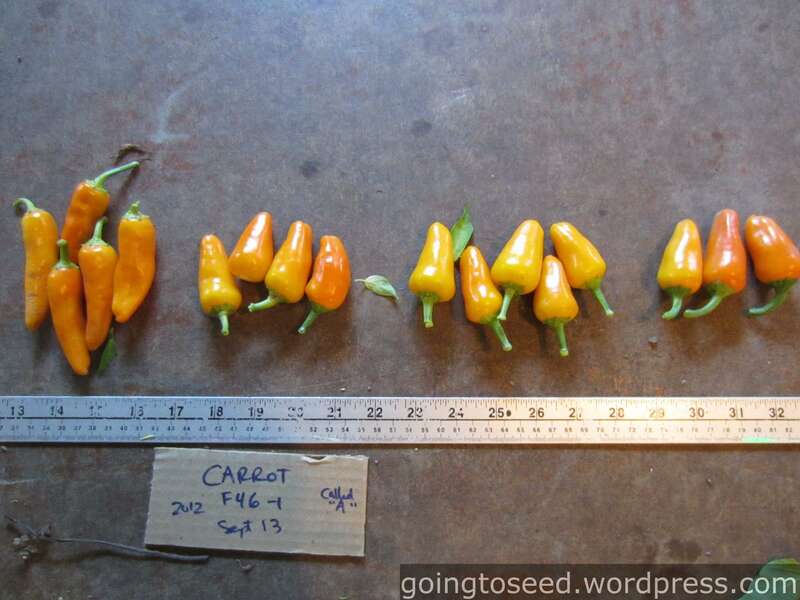 Seven or eight years ago I planted some Bulgarian Carrot Hot Pepper seeds from Fedco. 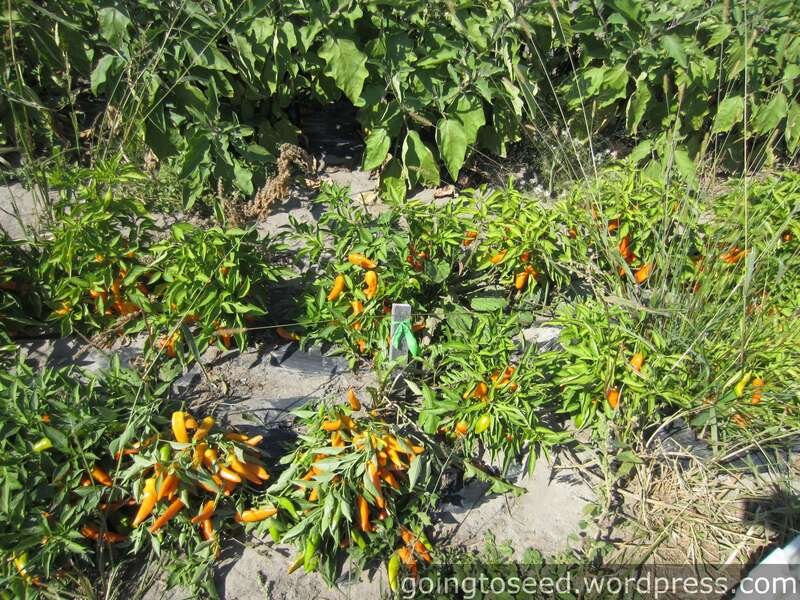 Most of the plants had elongated orange fruit similar to Cayenne peppers but with more flesh. 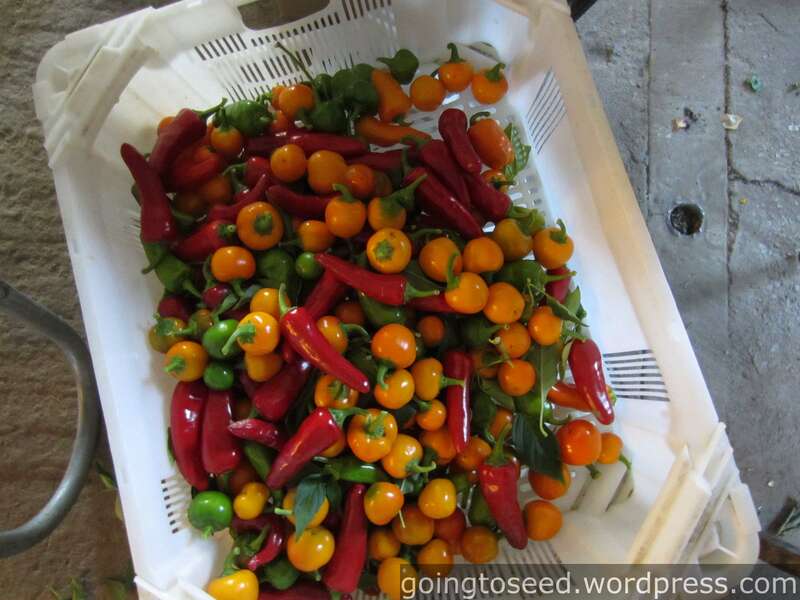 One plant was covered with fruit that were round and squat though equally orange and spicy. This rogue pepper plant was likely due to an accidental cross in the seed growers garden. Of course, I saved the seed from this rogue hot pepper – essentially a F1 cross. This is where things got messy. When you save F1 seed from, you get a lot of variation in subsequent generations. 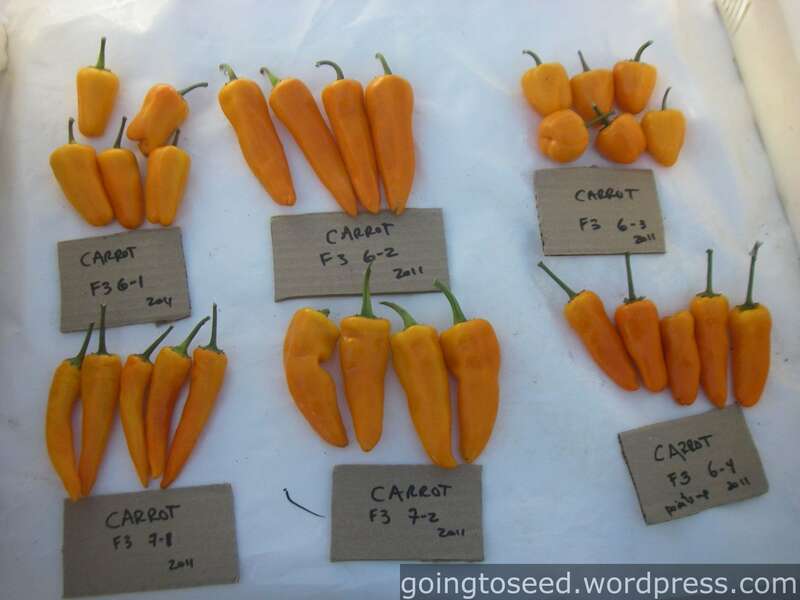 Only by consistently saving seed from plants that look similar over a number of generations do varieties start to stabilize. 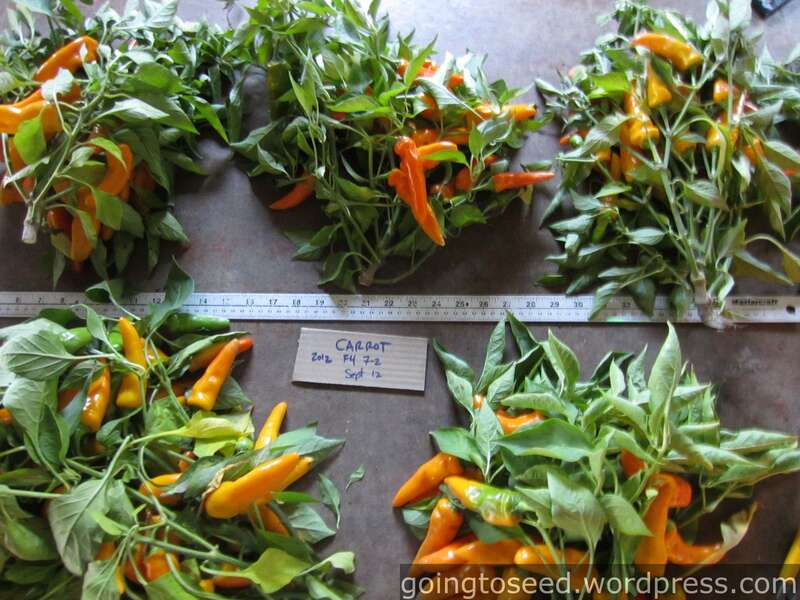 Nowadays, in the early generations after a cross I save the seeds from each selected hot pepper plant separately. The next year I grow 10-20 plants of each selection in the garden. I grow each selection in a row divided from the previous selection with a stake. Over the season, I evaluate each plant in each selection to see how uniform the selection is and whether any individual plants stand out. If the selection is very uniform I might mix the seed from the best plants together. If there is still quite a bit of diversity, I keep the seed from individual plants separate. In 2011, I selected 6 different plants. Each plant is labeled in the picture. The first plant labeled F3 6-1. F3 means the plants is from the F3 generation. 6-1 means the plant is the first plant selected in 2011 from the 6th plant in 2010. 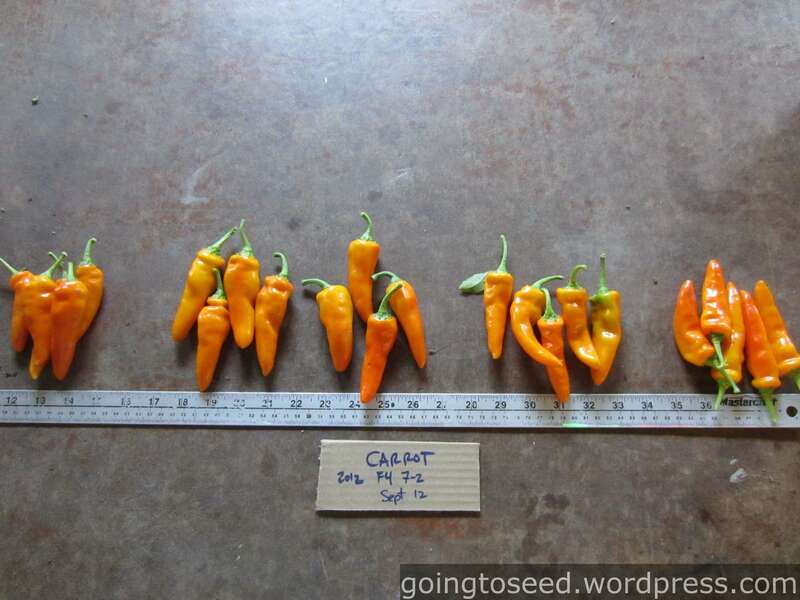 These 6 plants were all from 6th or 7th selection made in 2010. Plants 6-1, 6-2, 6-3 and 6-4 are therefore siblings. These plants are cousins with 7-1 and 7-2. 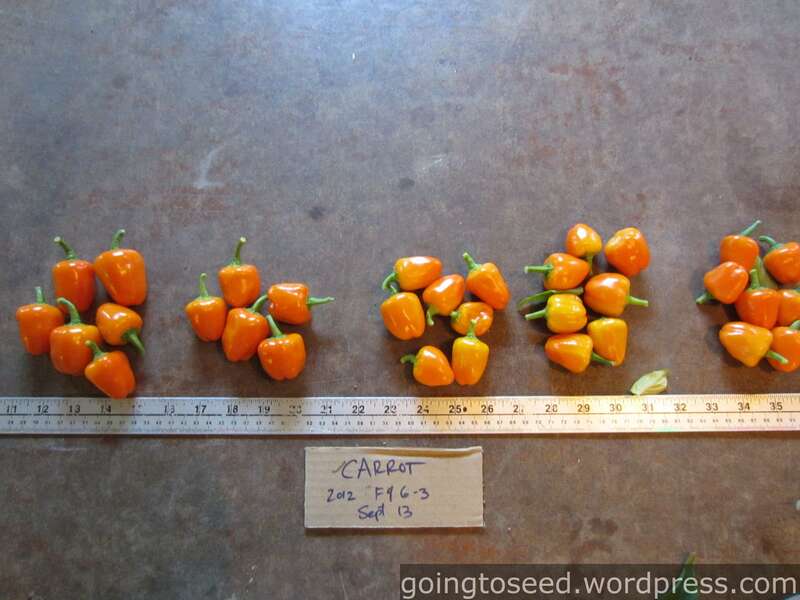 This gave me a quick idea of the relative yield, color variations, pod shape, and whether the fruits grows upwards or hangs down. This let me see how fruit variation was still present. Pods pointing down indicated hanging fruits, pods pointing up indicated upwards fruit. This also lets me compare the 2012 fruits with my 2011 picture above. In general you can see there’s less variation within each of the following 2012 selections than in 2011. I put the fruits from each of my selection into a separate quart to later extract the seed. This picture is actually from another set of selections in the F6 generation. and then head to market or CSA! Before extracting seed from each selection, I taste each fruit. 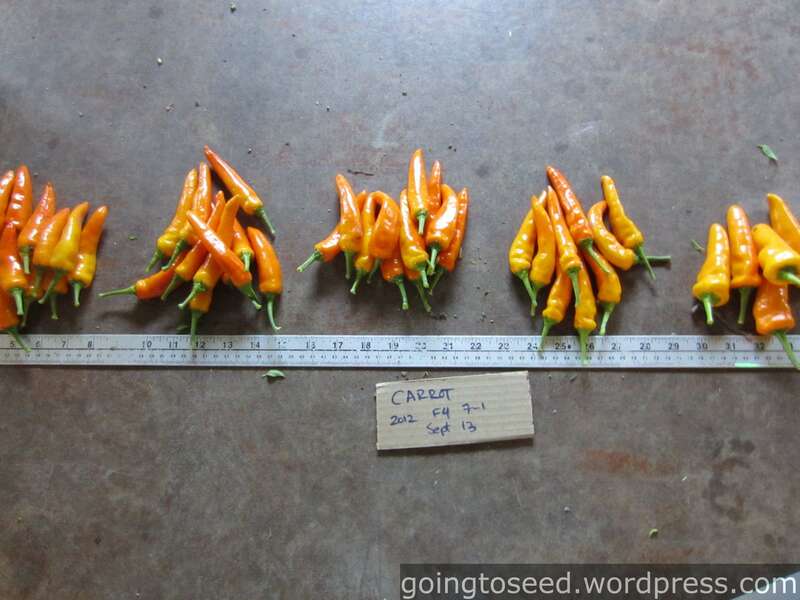 I start with the fruit bottom, then the side wall, and finally the core to see how hot these peppers are. I started doing this after I realized a Jalapeno I was working with had lost almost all of its heat. 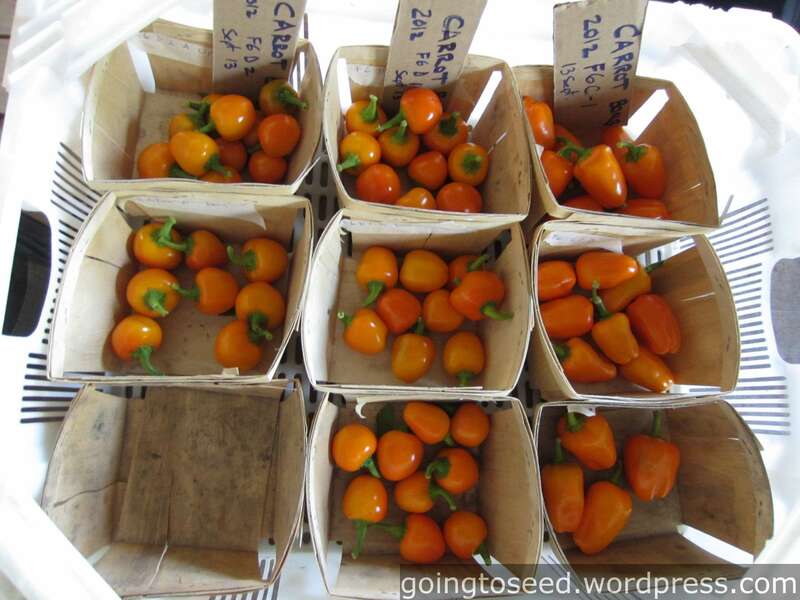 After selecting by taste for a future generations, most peppers are consistently and adequately hot. Needless to say this tasting happens over a few days. As it takes me 10-15 minutes after each “winner” before I can taste another pepper’s heat. Most of the peppers we grow are destined for eating. As such we grow these varieties side by side with no isolation distance. Though peppers are predominantly self-pollinating, there can still be low amounts of cross-pollination with plants grown this close together. Still I save seed from these peppers for our own farm use. Most of the time I don’t see any crossing, but when I do I get excited! 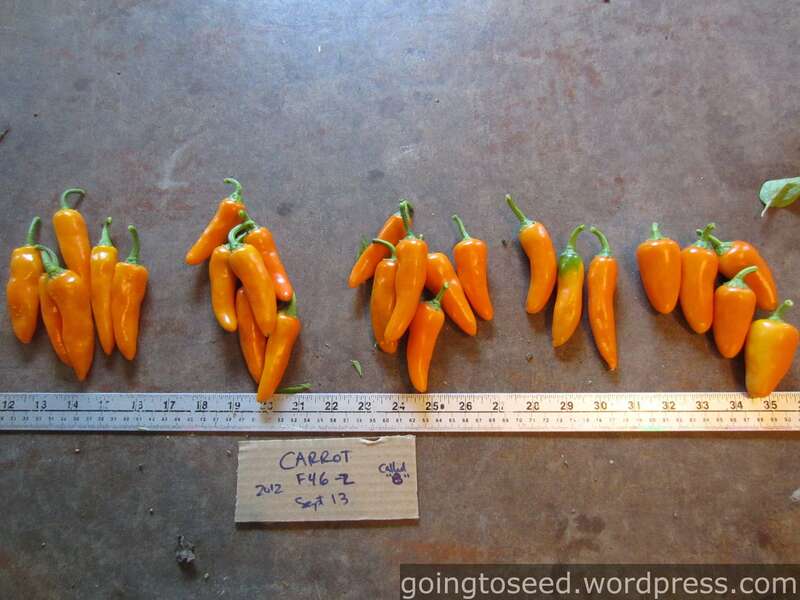 I should mention that I always grow hot peppers a good 200′-600′ away from our sweet peppers. This ensures our sweet peppers stay sweet and our hot peppers stay hot. Also, any hot peppers we grow to sell as seed are grown with 200′-600′ isolation distance since we want to keep these varieties pure. What Else Has Been Going on In Dan’s Life? You may have noticed I haven’t been posting much lately. Part of that of course is due to the growing season, and playing with hot peppers; and of course planning for the Nov 9-10-11 Seed Connections conference in Montreal; but mainly (and most importantly) Emily and I now have a little daughter named Stella in our life! You can see some pictures in the recent Tourne-Sol newsletter. Congratulations for the arrival of Stella and Elloit! Beautiful & healthy babies! All the very best for the families! Tunde and Jean – Thanks for the congratulations!